Active participation is the key element in meeting. Focus on the agenda to be the star of the meeting. One may fall behind if they divert themselves from the session. Little preparation may help to be smart. Sometimes we fall short of words or do not have idea about the topic, we lag behind when everyone tries to make some point in the meeting. Do not be dumb just take a step forward and say it is a good idea, why can’t we discuss about it. It is one of the smartest way to make the first move when one is finding great trouble to pitch their opinion. From then it creates a great environment where people start focusing on ideas and opinions that one have within them and start discussing upon it. Do not just blindly listen or take note of the presentation, but raise your hand and speak up to show the zeal that one have towards their work. Ask them about the numbers that were mentioned in the presentation, or ask for a clarification on the part which is making confused and stuck behind. This shows that one is being alert in the meeting and following the presentation. This turns the focus on the person from the presenter to one who asked the question for being so attentive and quick. Do not interrupt frequently with silly questions, but always be first to ask genuine doubts. Every meeting is for a purpose or to achieve a goal. They might discuss on several things how to achieve it, how it is be to done and the things involved in it. To be a smart peer in the meeting, ask for the benchmark to achieve the goal, and track the current status, and start talking about it for some time to divert whole team focus on you. In this way one can attain status also others get valuable information from the idea that have been raised. Sometimes we do actually see the things in papers and presentation, but actually it is not easy to make it practically possible. So then you can raise a concern like ” I am not sure how is it going to happen” or make them aware of the practical problems. 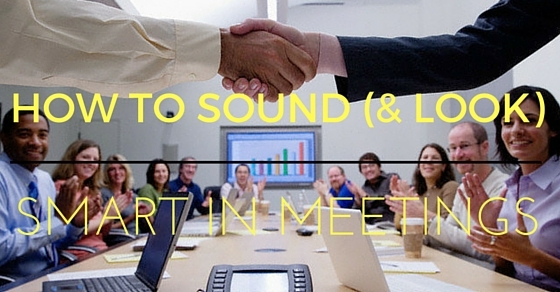 In this way one can sound smart in meetings. It is not taking about the negative part, but it is just to make them aware of implementation problems. Do not raise random questions but make sure that concern is taken into notice and discussed. It is good to start about the previous session and its follow up items, ask the person who was assigned to complete the task and understand the status, drag the meeting for some time and be an active participant. Ask them questions how long will it take or when can we see this done, and find out if they need any help. It is really good to kick start a meeting with the previous session summary, it refreshes the things to be discussed and everyone will be on same platform. This shows some volunteer in team and smart enough to lead it. To just challenge others, ask them to elaborate the process how it is be done. It might be easy to understand but to make it more structured and organized, discuss on the basic to conclusion part, this eats time and the whole discussion goes on the point that has been raised by you, thus one can be interesting peer of the meeting. It draws the attention of the people and one can counter the other person version to be more smart in the meeting. Let them make conversation until the highlights have been captured. Most of the meetings talk about the business. They generally talk about the goals and targets. People start talking about the tasks that are to be completed in order to attain certain goals, ask them is it measurable? it is not so important, but raise the concern. Ask them about the ultimate goal, and ask about how much percentage one need to contribute for it, and for how long. It also makes well defined and measurable targets being discussed in the room and everyone will have a clear vision of their objectives. While the presenter is done with his/her presentation, when he/she urges for questions, just start a conversation with the hurdles that are involved in it. It will not make someone as critic but it will actually make every person in the room to think about it and agree with the person, they may also get solutions and alternatives. Just raise the opinion and make them understand how one can deal with it. It is an interesting discussion and the most important part of the meeting, the purpose of meeting will be achieved and the time is precious for each and every individual so instead of dragging on some endless points talk about the core and key elements. Do not hesitate to tell opinion or ideas. Whenever there is an idea just share it in the meeting no one will make fun out of it, but they will help to understand if it is not a worthy one for the project. Also appreciate the ideas of others even it is a good or a bad idea, because one is trying to catch the discussion. They may modify the idea and get a better solution. Instead of being dumb and quiet just show up existence and way of approach towards the objective. Do not get puzzled of what is being discussed but try to clarify yourself to get rid of the confusion. Be honest and express that it is not much clear. Keep writing important points in notepad, while the meeting is going on. Also nod head that one is attentive in listening. It helps to review each and every important point later. Whenever there is a next session, one can actively participate instead of breaking head what is being discussed in the last session. Also they can work on follow up items and give update in their next meeting without missing anything. Also while the presentation is going on, one cannot interrupt so once all the questions being noted in the writing pad, they can ask at end of the session. Be quick to understand the point faster than others, before others search for answer, be smart enough to answer earlier than them. For example: If someone says the production rate in numbers, convert into percentage and say it. It surprises the other peers in the meeting, though it is simple logic be quick and prove smart. Just point it out and make a little conversation. It shows that one is more attentive and peculiar about the numbers, sometimes one may be wrong but it is fine until and unless one makes sensible statement. Overall impression is to make a statement and people discuss on it, one need to debate on it, but have to be smart. Avoid badmouthing, it may bring problems. One may not agree or dislike the point that has been highlighted by other peer, just make a perfect statement to counter them, but do not criticize or speak rude, it will damage the reputation. Impress them gently with smart answers, pick some good points of other participant and encourage them also help them to justify with your answer. Try not to make false statement instead let them know that it is not clear to understand or ask anyone to make it more efficient. While disagreeing with other person’s statement make a soft statement “it is not likely but it is the other way” something like this may help them to think once again. As discussed earlier there is no point in elaborating the pointless discussions, it is waste of time, interrupt them instead of singing song along with them. Highlight the key objectives and ask them how it is going to work and ask them to analyze on it. Everyone will appreciate this interruption because every participant takes out their valuable time for progress. So raising voice will not cause much trouble, but they will recognize as a smart participant in the team, one can kick start to refresh the peer’s mind to get back to the base point. The following mentioned are few smart words to make use of for sounding smart. Ask the team what is the next action plan. While the discussion is going on ask for the next steps in order to resolve the particular issue. This is one of the intelligent word to sound smart in meeting. Drag the meeting for few more minutes by raising this topic. One need not talk in the meeting, but asking for the next steps may help others get chance to think for a second about the question. It tells that the person is very much worried about the current issue or topic. One can pick the conversation by saying that it is fact, one can start their version of summary and talk about it. It also encourages the other person opinion and it tells them that he/she agree with their point. All one need to do is appear smart to get appreciation. It is one of the good trick to sound smart. This will help earn some more hours for the person. Everybody start paying attention what one is going to talk after saying this clever word. People respect the person and listen to their speech. One can try to wrap up the meeting or just interrupt the long session by just saying let’s go back to the bottom line. Just talk about the facts and what needs to be done at the end of the day. It is to ask the peers to talk about the important point or the ultimate result for what they are breaking heads in the meeting. Revoke everybody in the room to cut the crap, start analyzing about the objective and its results. This line will help to wrap up the discussed points and how they contribute for the goal. One can state that there is lack of vision, when people just talk about things which do not actually are hard to visualize, this shows that person is deeply thinking about the vision and worried about the things getting into practical. It is one of the big word to sound smart in the meeting. It tells us that the one is efficient enough to talk about the results and practical possibilities. They can consume some more time by talking about where they lag behind and what factors lead to reach the objectives. Although one do not have much idea about the topic, one can use this line. They take a break here to continue the topic, they try to discuss more in detail about the point raised by the member, also one gets clear idea if they actually trying to do. They come with a better solution, to be a smart peer one need to pitch their voice in meetings with these intellectual words so that the people start discussing on it instead of endless points with no outcome. So follow the above tricks and be smart.